Hello my name is Andy Nolan and I am a fully qualified Government Approved Driving Instructor (ADI). I have lived in Radcliffe with my wife Joanne for over 20 years. Our eldest son is currently studying at Queens University in Belfast and our youngest son attends St Monica's in Prestwich. Before becoming a driving instructor I worked in the IT industry for over 20 years and during that time I developed and presented training courses and this is how I realised that teaching and training is what I really wanted to do. My interests are varied and include managing and coaching junior football teams and you might even see me out and about walking our daft dog Polly ! I provide intensive and semi-intensive driving courses as well as individual driving lessons using the unique LD System of driving tuition. I can normally cover Bury, Whitefield, Radcliffe, Heywood and Prestwich plus the surrounding areas. 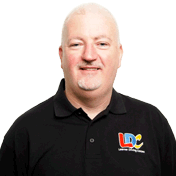 I operate my business under the LDC franchise which means I am governed by LDC's stringent customer care and tuition standards plus I am proficient in delivering the LD System of driving tuition. The LD System is an exciting way to learn to drive which saves you money by reducing the number of lessons it takes to learn. All LDC driving schools share a common aim - to provide the highest standards of tuition at the lowest overall cost. As an LDC driving school I can also offer LDC's state-of-the-art driver training products for the UK theory, hazard perception and practical driving test. Included in these products is the UK's best selling Theory Test software and the number one DVD-ROM software Driving Test Complete (as reviewed by Auto Express magazine). Whether you are choosing driving lessons for yourself or for a member of your family, its vital that you make the right choice. The safe drivers of tomorrow are the well-taught learners of today. So if you are interested in taking driving lessons or an intensive driving course with a patient, friendly driving instructor in Bury, Whitefield, Radcliffe, Heywood and Prestwich and the surrounding areas please "Contact me"